The Austin Film Festival’s opening night film this year was a screening Barry Levinson’s new film, The Humbling. The film marks yet another collaboration between Levinson and star Al Pacino, with the two previously working together on the excellent HBO film You Don’t Know Jack, which won Pacino an Emmy and Golden Globe. 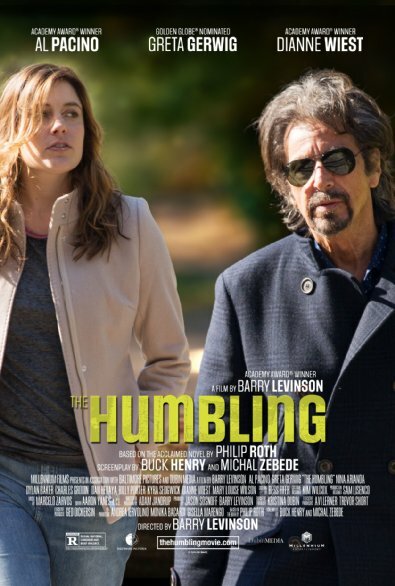 The Humbling is an adaptation of the novel of the same name, written by Philip Roth, and the film has received some buzz from Venice surrounding Al Pacino’s performance in the film. It’s a film about the theater, which is ironic since I had a break during the festival and went to go see Birdman, a film about Broadway (more on that film later). Let’s find out if The Humbling is worth seeing whenever the film is released. Pacino stars as Simon Axler, a famous stage actor whose having a crisis during the twilight of his life and career. He has lost the will to act, and can’t act the way he use to years ago. He goes to therapy and even a Mental hospital to help with his condition, but he’s not sure if any of it is working. Pacino then meets up with the daughter of his best friends from years ago, played by Greta Gerwig. Even though Gerwig tells Axler that she is a lesbian, the two embark on an affair, with the disapproval of the parents, with the mother being played by Dianne Wiest in a small role. The Humbling was adapted by Buck Henry, whose best known for co-creating Get Smart with Mel Brooks, and co-writing the screenplay to The Graduate, one of my all time favorite films. Henry co-wrote the script with newcomer Michal Zebede. The Humbling is nowhere near the comedy genius that was Get Smart or The Graduate, and to be honest the film is not that great. But like a good stage play, it’s strengths come in the acting, with Al Pacino giving one of his best big screen performances in quite some time in this film. Pacino is both funny and tragic in the role of an actor who feels more like a bygone than a still relevant, working actor. Greta Gerwig also does some nice work here as the lesbian turned girlfriend of Axler. Other than that, there really isn’t much to do here with the film. Other than the performances in the film, I kind of forgot about seeing the film, even though it was a couple of days ago. I love Barry Levinson, and he’s one of my favorite directors. While I can understand people for saying that Rain Man is overrated, I’m on the other side and think that it’s a really terrific film. The thing with Levinson is that other than his work on television, he hasn’t made a very good film in a long time. So it doesn’t really shock me that The Humbling wasn’t all that it could have been. Its not a bad film, and the performances are very good, but like I said earlier, it’s a pretty forgettable and unimpressive film. I see films like The Humbling all the time at film festivals, where the crowd likes them and you laugh at them during the run, but after the festival, I’ll probably forget I’ll have ever saw it. Hopefully Pacino’s next film, Manglehorn, which was shot here in town and was directed by David Gordon Green, will be a little more memorable and worthwhile than The Humbling. October 26, 2014 in 2014 Film Reviews, AFF Reviews, Film Fest Coverage, Movie Reviews.